Released on: November 11th, 2016. 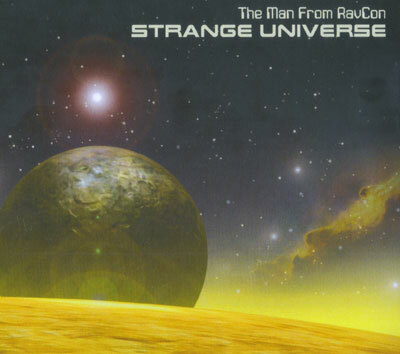 Mike ‘The Man From Ravcon’ Brown’s latest album is the aptly titled Strange Universe, another entry in the multi-instrumentalist’s ever expanding and increasingly hard to categorize catalogue. Brown plays everything on his records all by himself, and leans towards heavy doses of prog and psych with hefty dollops of surf guitar thrown into the mix. The end result typically feels like a soundtrack to a movie that never existed in the first place, and this album continues and expands upon that concept. Predlude/Jupiter starts off calmly enough, a simple medley laid down on a piano all by itself, then accompanied by some keyboards/synths, drums and other layers that slowly build over top. Some fuzz guitar pushes its way through, and then it’s straight up proggy space sounds for a bit. This evolves into a seriously Pink Floyd-esque soundscape that’ll chill you right out and take you to weird places. Five and a half minutes later and the opener segues into Quasar, which starts off with a very basic drum machine loop overtop of which Brown lays down some pulsing beats, but again, they stay basic, almost rudimentary, at least to start with. Like a lot of his music, it builds in complexity as it expands. It goes in some interesting, almost heavy directions a few times but always comes back to the simple drum machine loop. A somber piano piece opens the title track, as an eerie melody slips through with clever, subtle style. Some sort of woodwind sound plays overtop, then it goes quiet… silent until a drumbeat slowly emerges from the murky depths, bouncing alongside the kind of pulsing synths that would make John Carpenter nod in approval. Its gets dark from there, layering a gothic element that feels like a throwback to a Fulci zombie movie or something like that. Friday’s Fugue is a shorter, even jauntier track, a rather pleasant bit that uses a harpsichord sound as its backing to create a playful sound. Picture a naked woman running through a field in a Borowcyzk movie and this is the perfect background music to that scene! Neptune takes things in a different direction from there, heading deep into Goblin-meets-Morricone inspired prog territory albeit with a warbly sort of sci-fi vibe to it in place of a more ominous horror movie sound. Poseidon starts off with plenty of bleeps and bloops and watery sounds that, if you close your eyes, makes you feel like you’re in a submarine or something heading down into the depths of the ocean. Drums swell up, guitars poke through the wave of sound, the density of the track increases and it all builds to a pretty strong crescendo. Zero Gravity is well named in that it has a light, bouncy feel to it when it starts. There’s a simple but catchy bass line to open things up, the drums keeping time but not showing off. Keyboards sway into the mix, spacey Gilmour-esque guitar. This moves perfectly into Juggernaut One, which plays off of a similar sound but brings things into lighter, bouncier territory. It’s a quick but effective number that is in turn pretty much sideswiped by Prelude (Reprise), which ties things into the opening track quite nicely so that when the closer, the seven minute epic that is Ancient, hits your speakers you’re ready for it. Again, there’s a lot of harpsichord here, making the track feel as if it has somehow come from the past, but the synths and guitars that collaborate and enlarge the sound, when combined with some pretty deliberate percussion, prevent the song from being pigeonholed. It’s a great way to end a really strong album of weird, spacey, attention grabbing instrumental music.